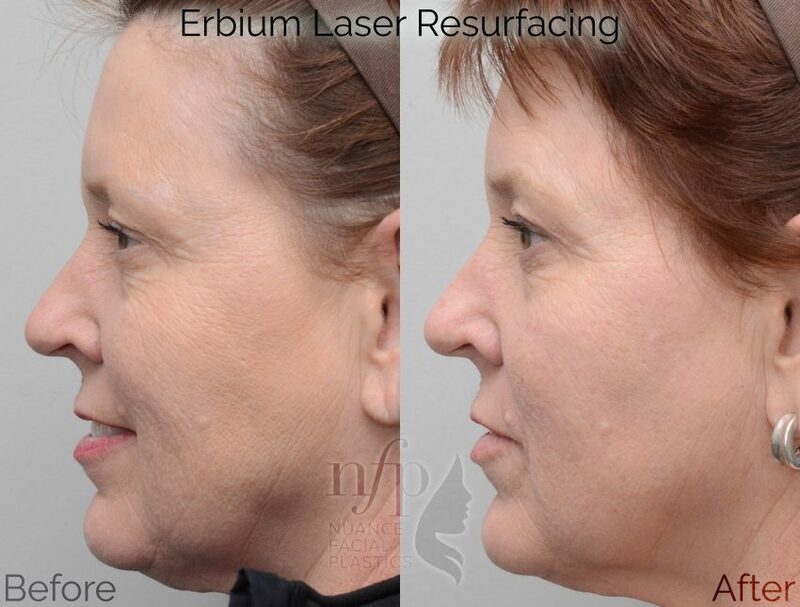 Thank you for stopping by to check out our results! 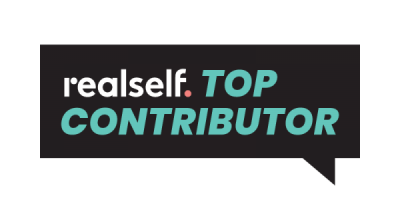 I wanted to write an introduction letter to you so that you can better frame your time with us. 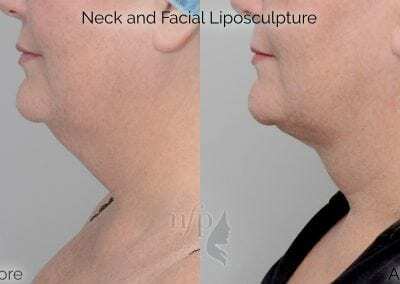 Below is a small sample of the treatments that some patients have had with us, and we wanted to thank them for allowing us to use their pictures. 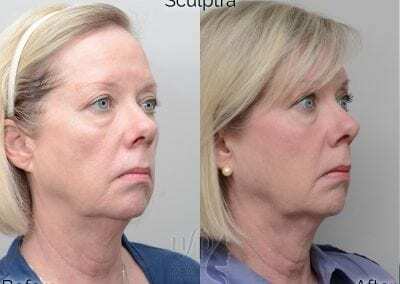 We try very hard to give you realistic imagery that is reproducible, and that means taking pictures with people not smiling and largely unflattering lighting conditions. 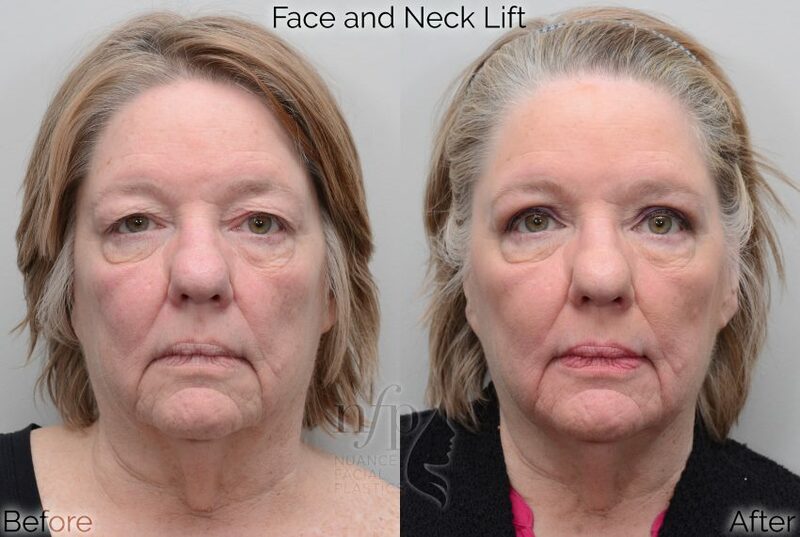 The facial expressions in these pictures are flat, which helps with the consistency of our images but does not convey the feeling that the patients have about their treatment well. 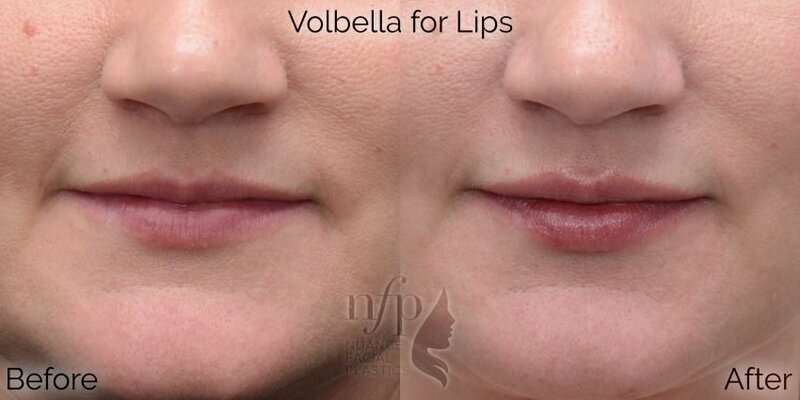 Also, faces are intensely personal parts of ourselves. 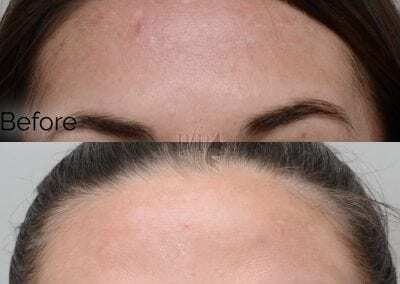 This is an important idea to keep in mind as you look at these pictures, as some results are ones that you can see from a distance or immediately, and others may not be as obvious, and take a little more time to discern. 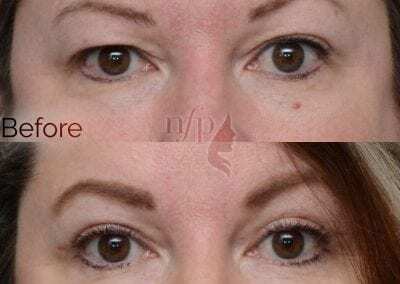 In the face, small things matter, and subtle changes can do a lot for a person. As you look at our gallery, I urge you to empathize with our patients and imagine that their face is yours. 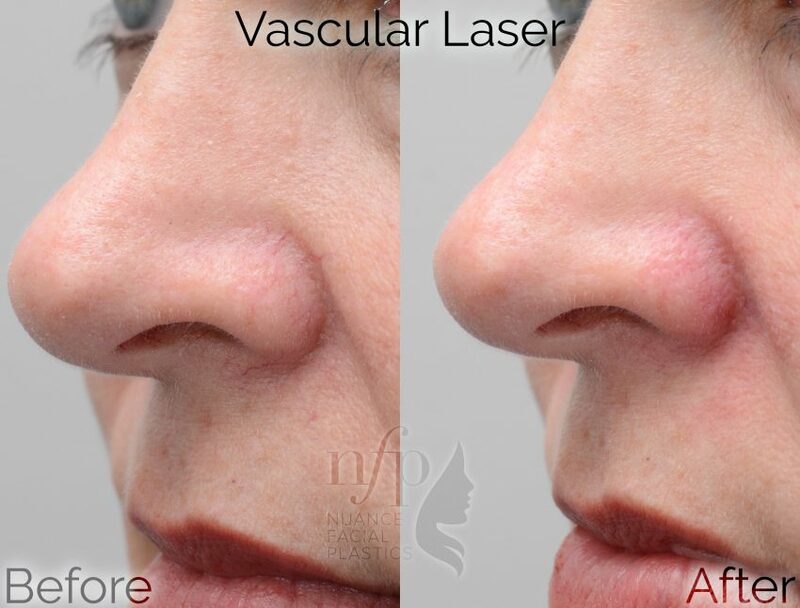 Imagine the way you would feel if you had a troublesome area improved in the way that our patients did, and how that would impact your image of yourself. 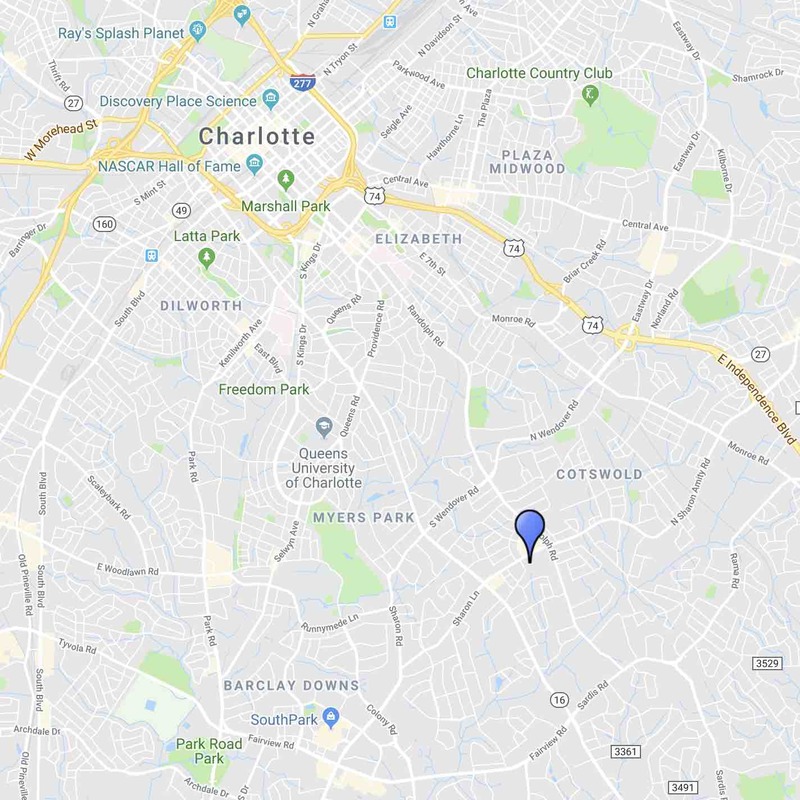 Not every result is a big difference to an observer’s eyes, though I can assure you that every result that we show here has had a large impact on the people we have treated. 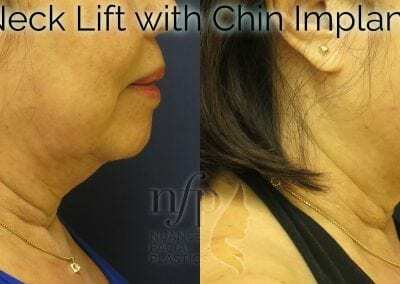 The neck line, or “double chin”, is troublesome for many people. 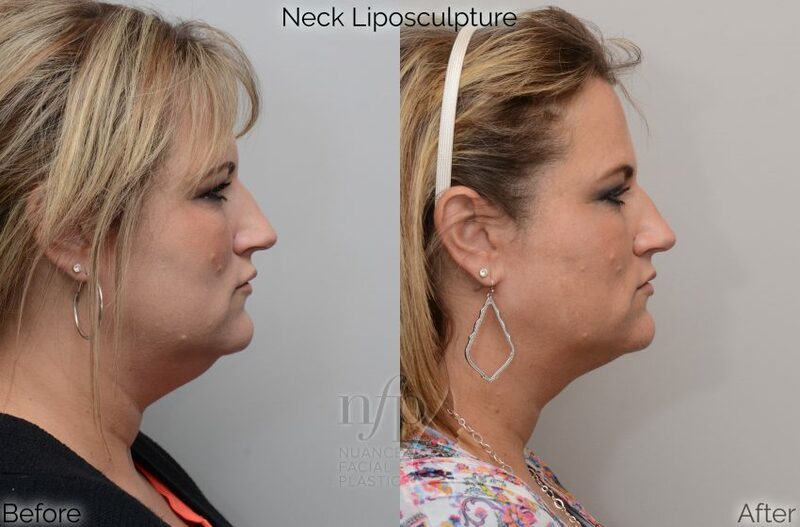 The patient shown here opted for Neck Liposculpture, or Neck Liposuction, which she had in the office with great results as seen here. 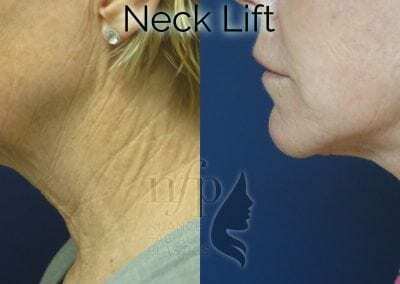 This patient wanted improvement in her neck line, as well as better definition between her face and neck. 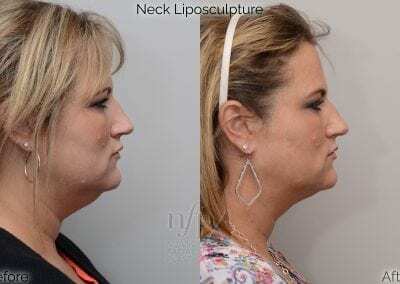 After discussing options, she wanted to have Neck and Facial Liposculpture, or Liposuction, to improve this. 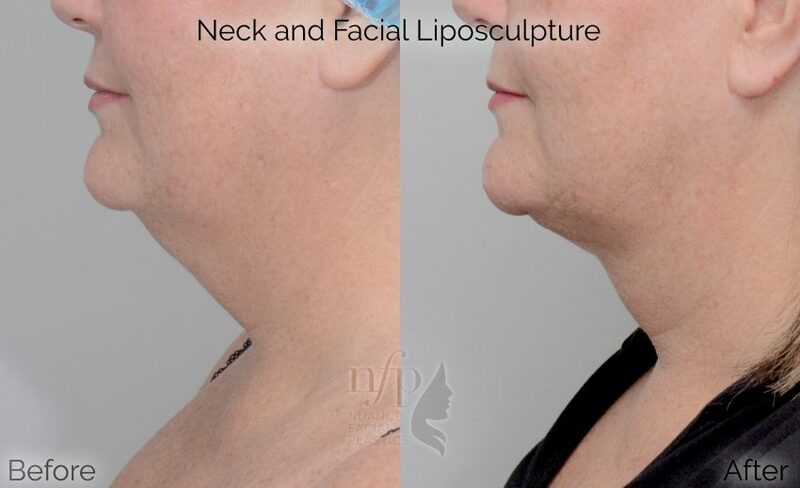 See the results here, with a soft shadow now being cast on her neck by her face and jawline. 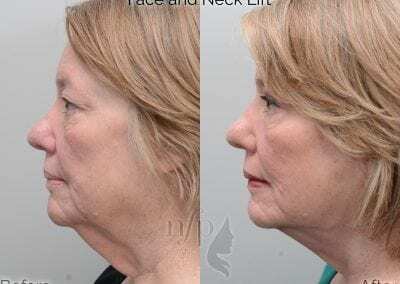 The neck and jowls are a problem area for many of us, and this patient opted to treat these early signs of aging with a Face and Neck Lift and Fractional Erbium Laser Skin Resurfacing. 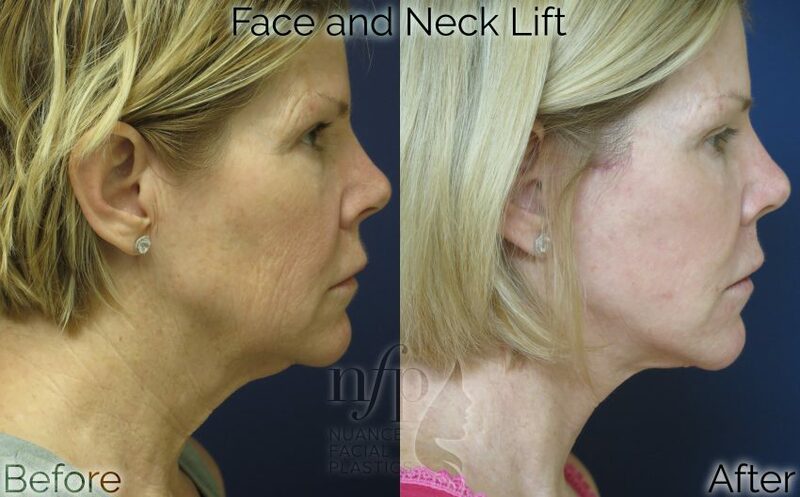 This patient wanted improvement in her neck line, which was “falling”. 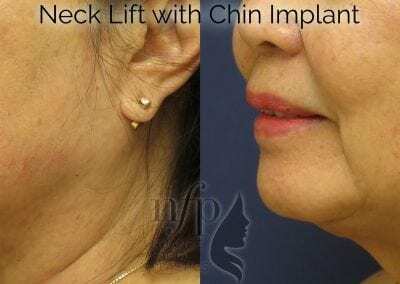 After discussing options, she chose a neck lift with a chin implant, to both sculpt and lift the neck line, and to lengthen it with a chin implant. 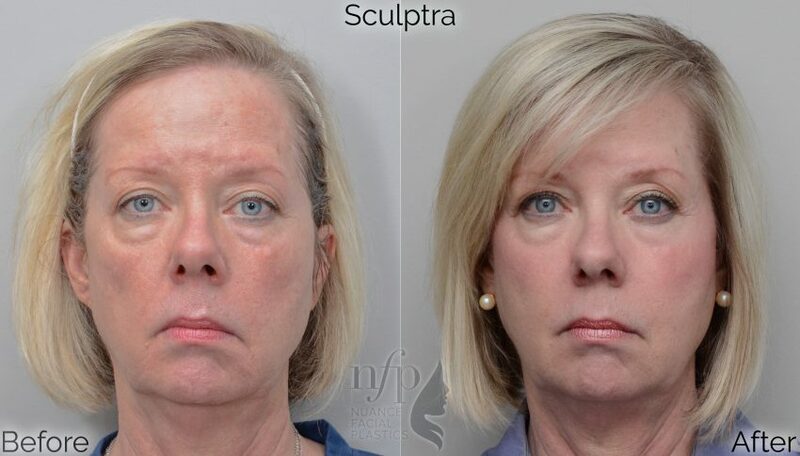 She loves the new look! 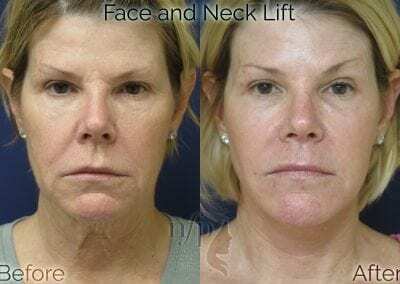 Our patient seen here was self conscious about the appearance of her neck, especially in pictures. 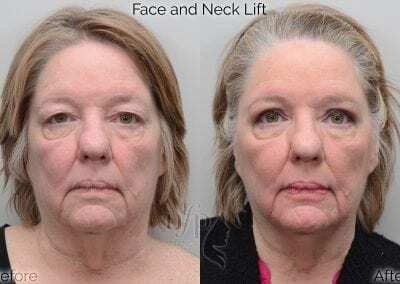 She underwent a Face and Neck Lift with Upper Eyelid Lift, and got a much more youthful, rested look that better matches her personality. 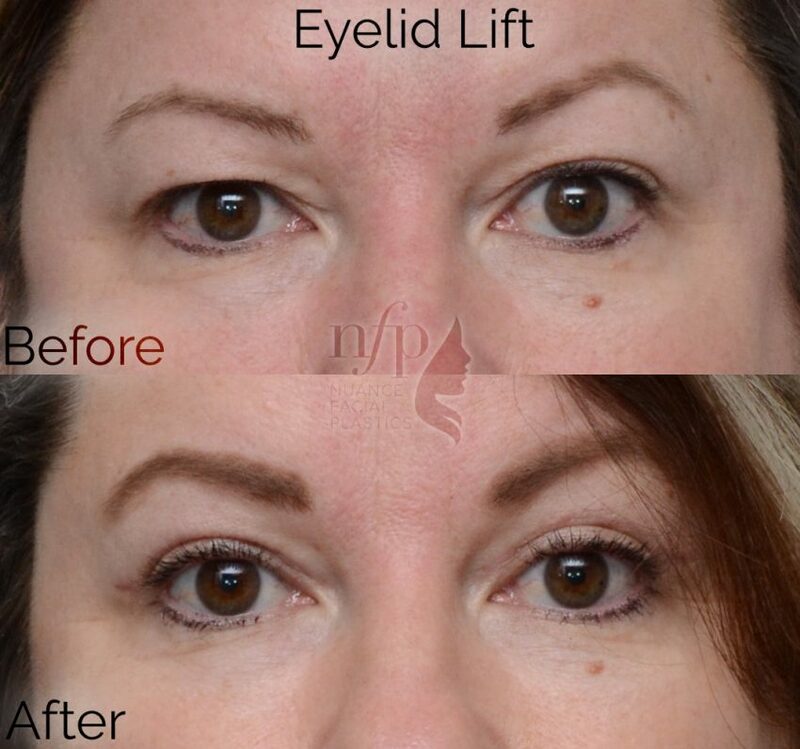 The Upper Eyelid Lift, or upper blepharoplasty, gives a “rested” and “engaged” look to this patient’s eyes, and whole face as well. 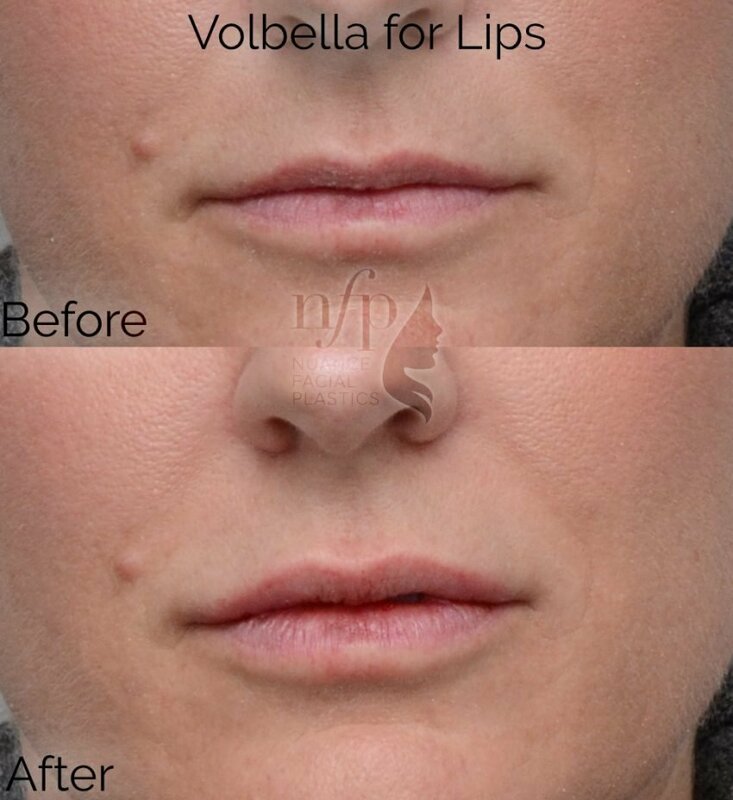 See her results for yourself! 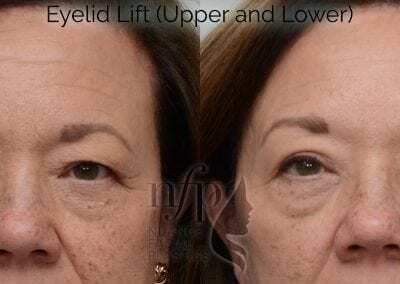 This patient was troubled with the appearance of her eyes in the mirror, and had excellent results with an Upper Eyelid Lift (Upper Blepharoplasty) along with fillers to her lower eye bags (not shown in this picture). 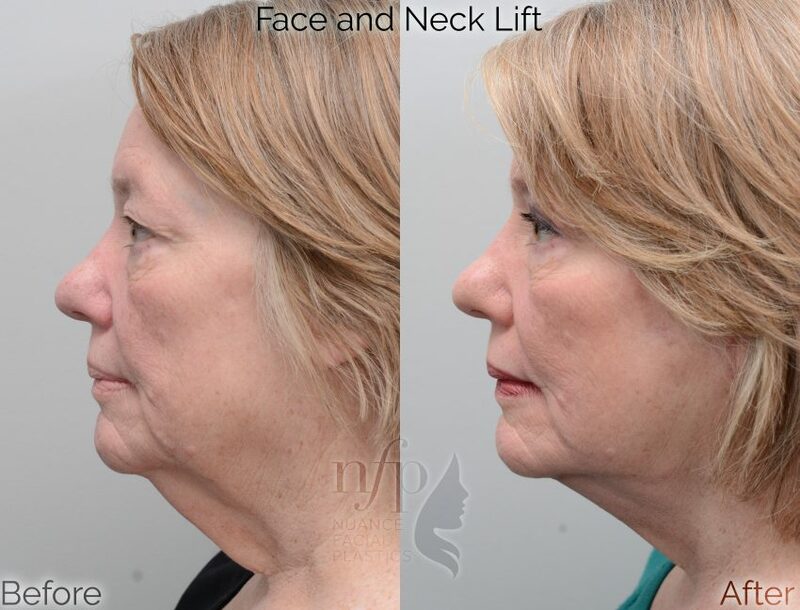 See her transformation! 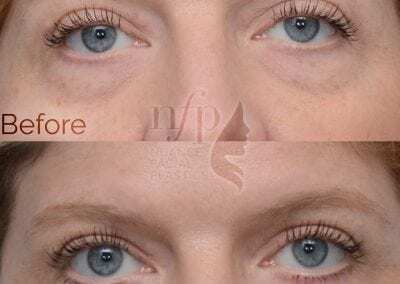 Before and After pictures from a patient that had Upper and Lower Eyelid Lifts (Blepharoplasty) at Nuance Facial Plastics. 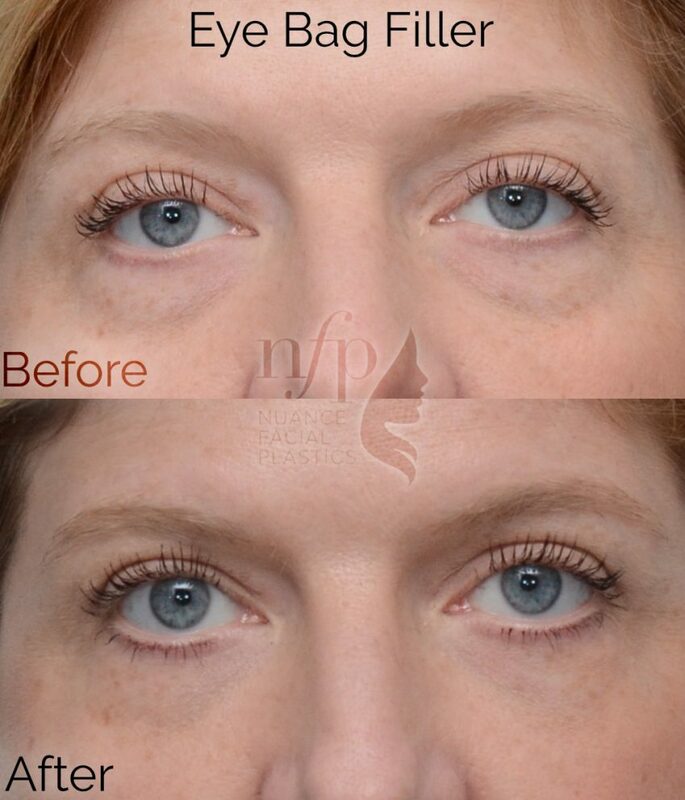 This patient did not realize what she was missing until she commented in the recovery room, “I had no idea how much light I was missing!”. 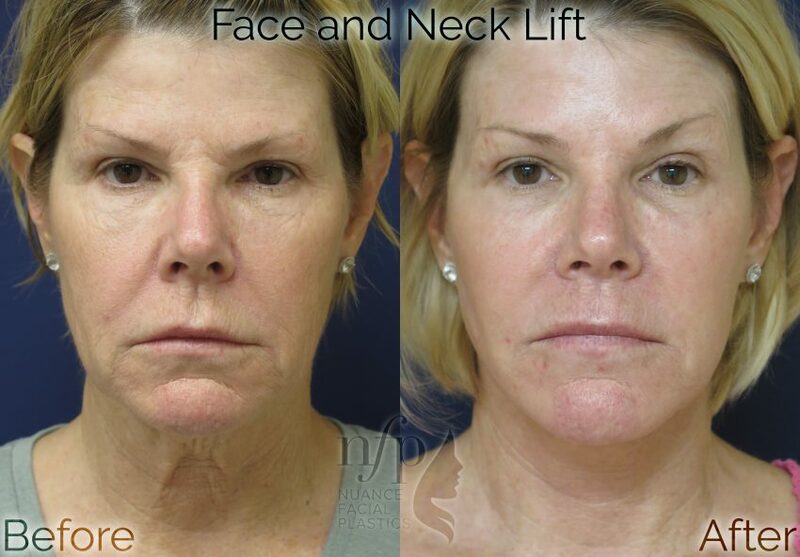 See her transformation from a more “aged” and “unhappy” appearance to a more “youthful” and “engaged” look. 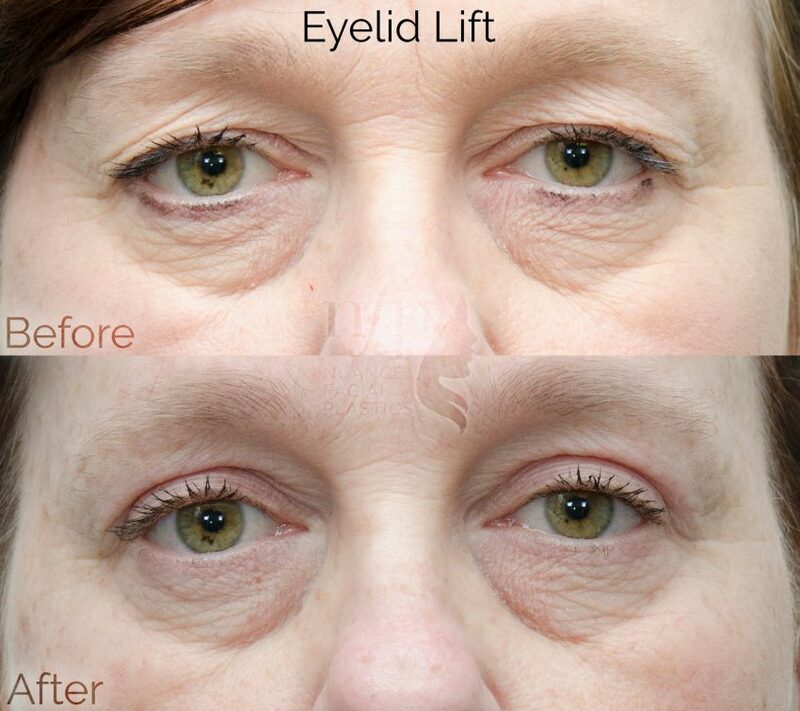 “I felt like a weight was lifted off of my eyes!”. 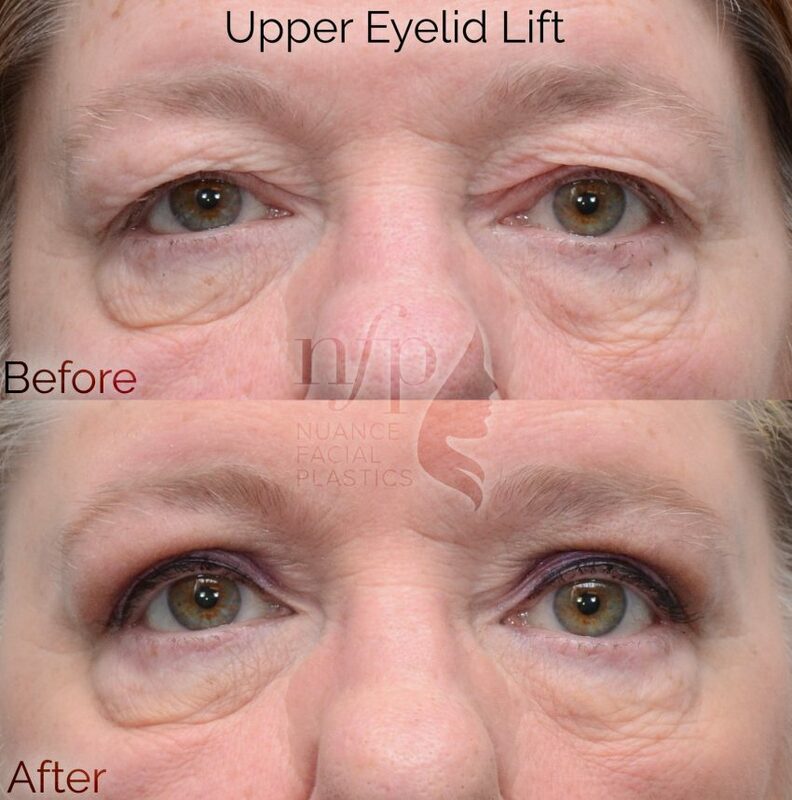 This patient was treated with an Upper Eyelid Lift (Blepharoplasty) at Nuance Facial Plastics. 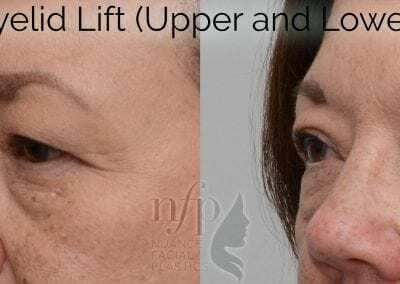 Not only was she happy with the results she saw in the mirror, she noted that she felt “a weight lifted off of her eyes”. 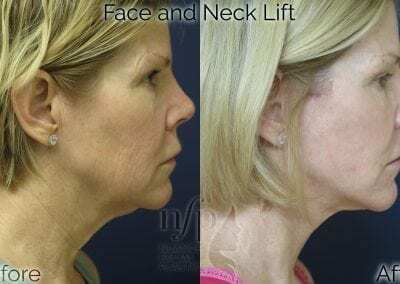 See her great results! 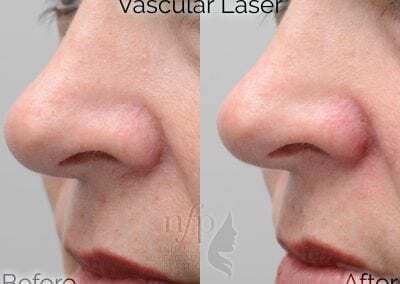 Broken capillaries, or telangiectasias, of the face can be treated with our Vascular Laser with immediate results seen the pictures here. 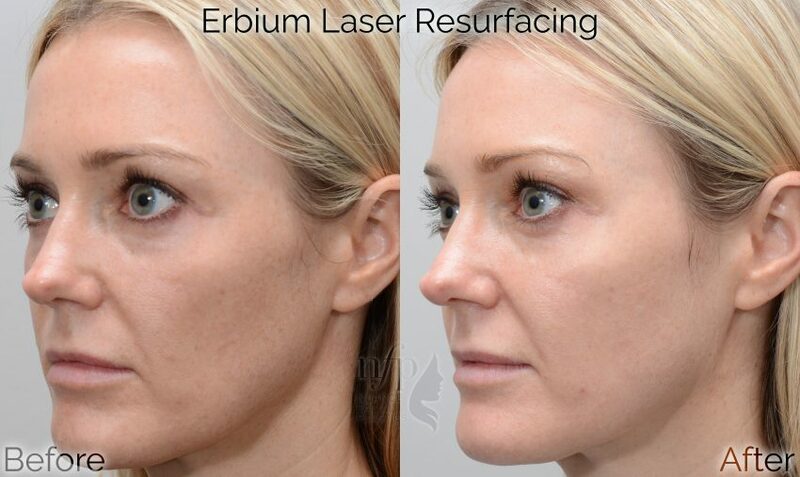 This is a permanent solution, with the redness seen in the “After” pictures disappearing after 15 minutes. 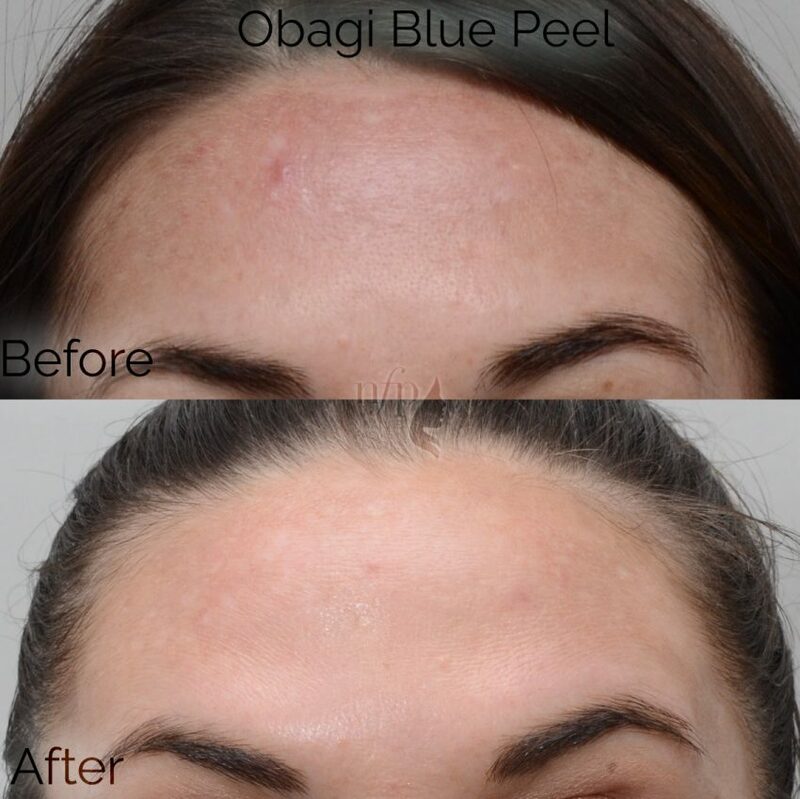 The Obagi Blue Peel is a great treatment for sun damaged, or prematurely aging skin. 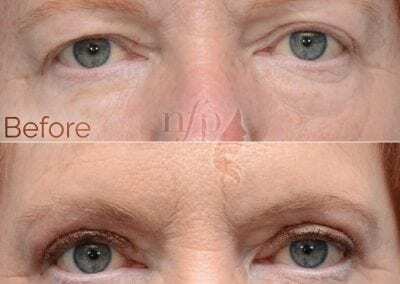 The reduction in pore size as well as the improvement in skin pigment changes and texture are dramatic. This patient’s skin has a tendency to form superficial blood vessels (telangiectasia) as well as rosacea, a pink or red coloration to the facial skin. 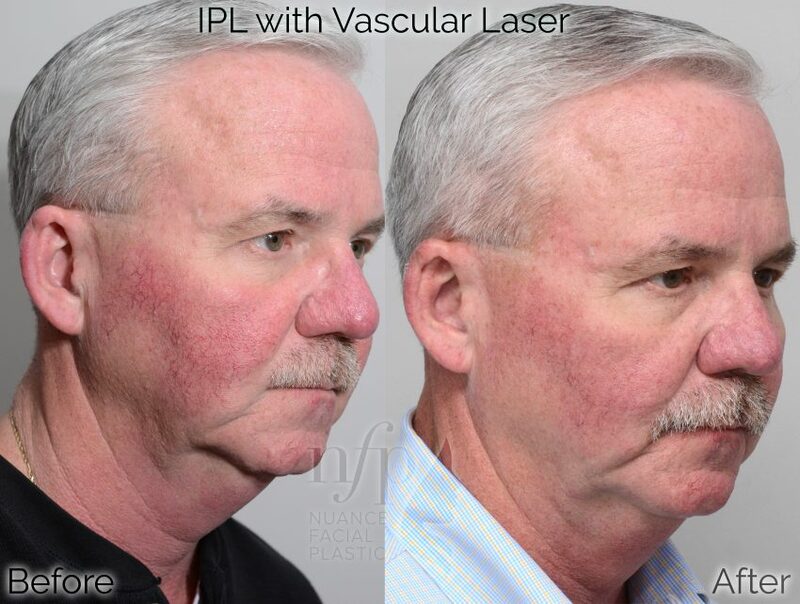 He underwent Intense Pulsed Light (IPL) Photofacials as well as treatments with the Vascular Laser to treat the “broken capillaries” in the skin, and had a great improvement after just 3 treatments. 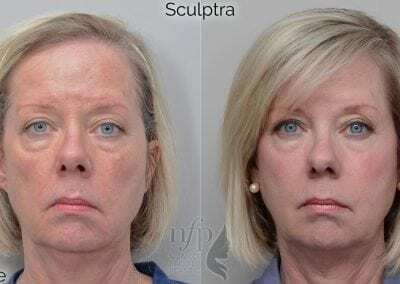 This patient wanted to treat her aging and sun damaged skin. 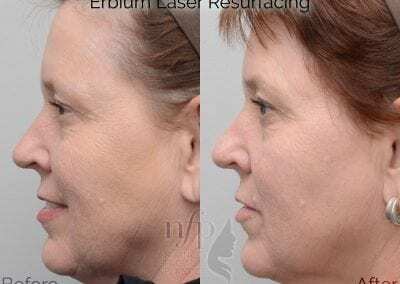 She underwent a single treatment with our Fractional Erbium Laser Skin Resurfacing and had a great reduction in her fine lines and wrinkles. 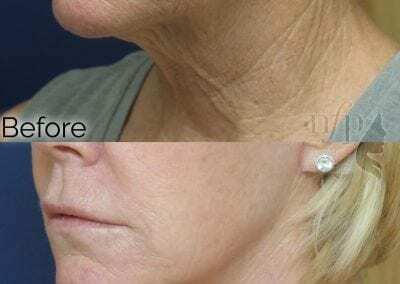 Our patient here underwent multiple IPL Photofacials and optimal skin care with Vitamin C, Renova, and Hydroquinone, and the results are shown in the Before picture. 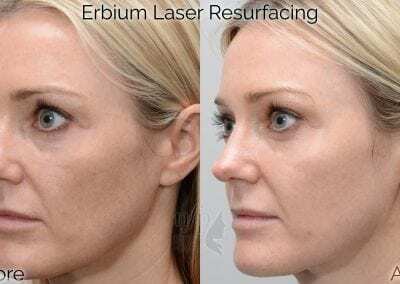 See the improvement in her sun spots and pigment after a single treatment with the Fractional Erbium Laser in these pictures. 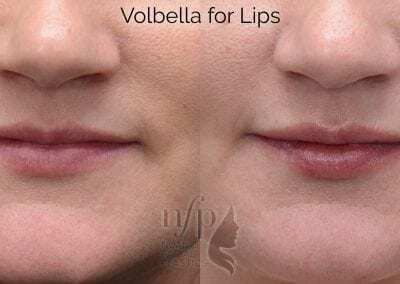 Volbella is a great product for lasting volume in the lips. 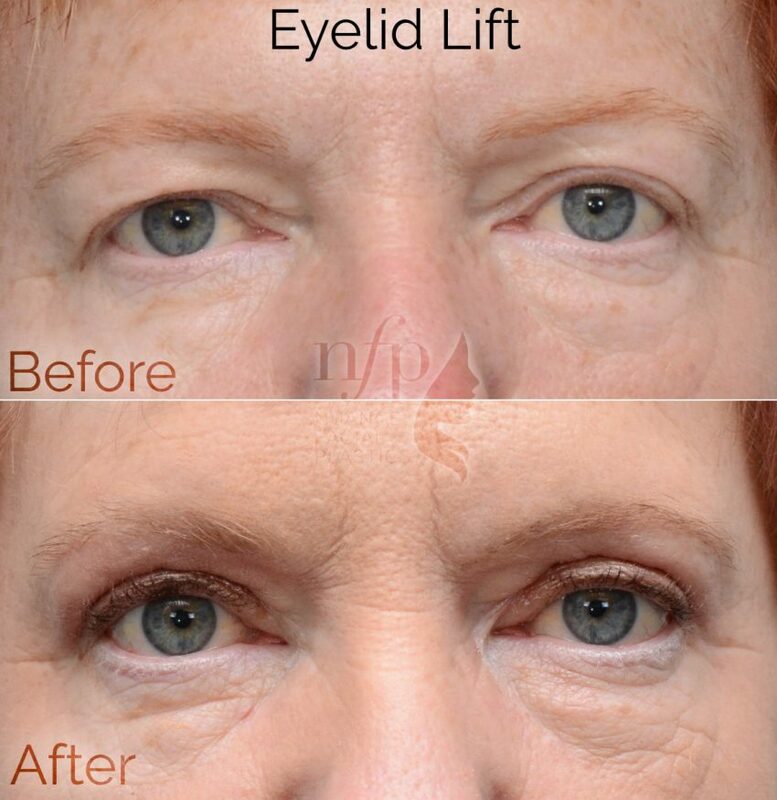 As seen here, a “dehydrated” look can be converted into a “plump” look while keeping the results natural appearing. 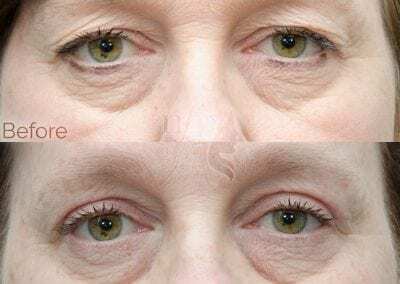 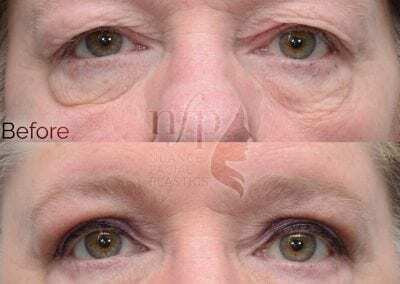 The tear troughs, or “circles under the eyes”, can give a “tired” look, and treatment with a small amount of filler can yield a great, “rested” look. 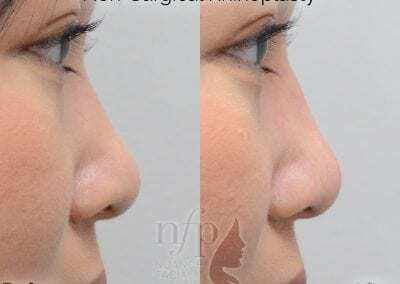 This patient wanted more projection to her nasal bridge. 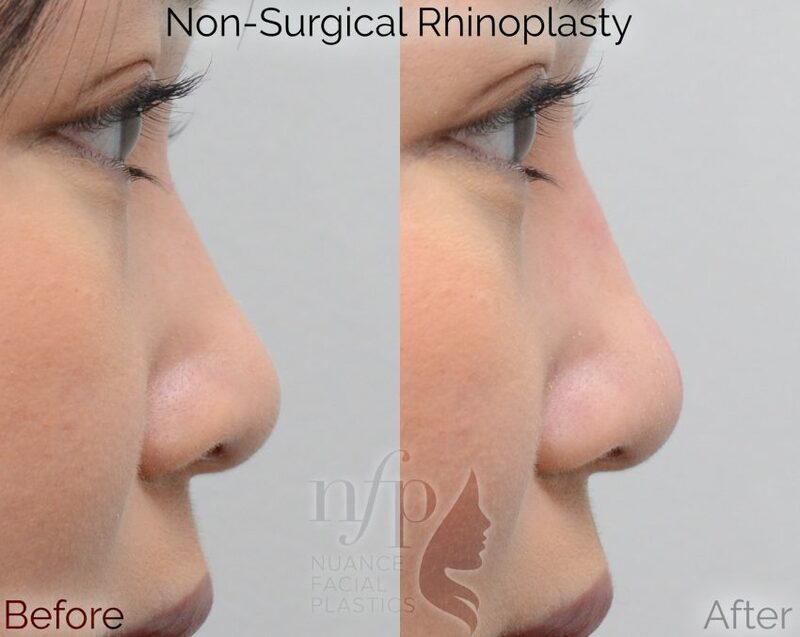 This was done as an in office procedure, a Non-Surgical Rhinoplasty, at Nuance Facial Plastics, with great results. 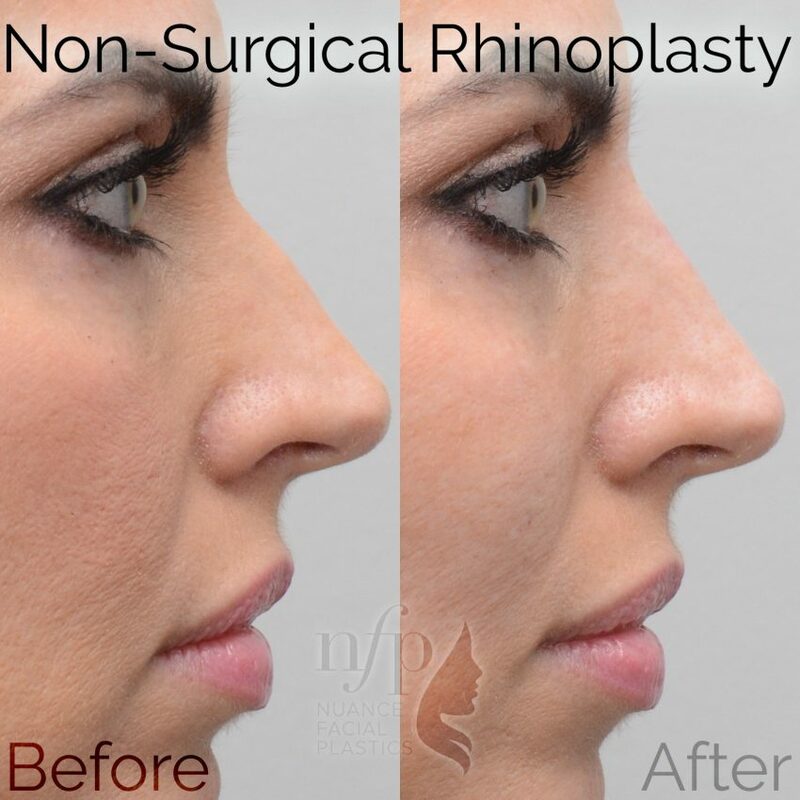 The nasal profile can be addressed well with a Non-Surgical Rhinoplasty. 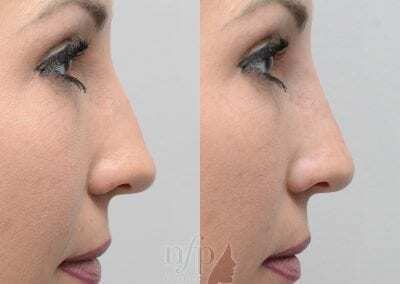 This patient had a subtle nasal hump that was visible in pictures, and a quick procedure corrected this with great results. 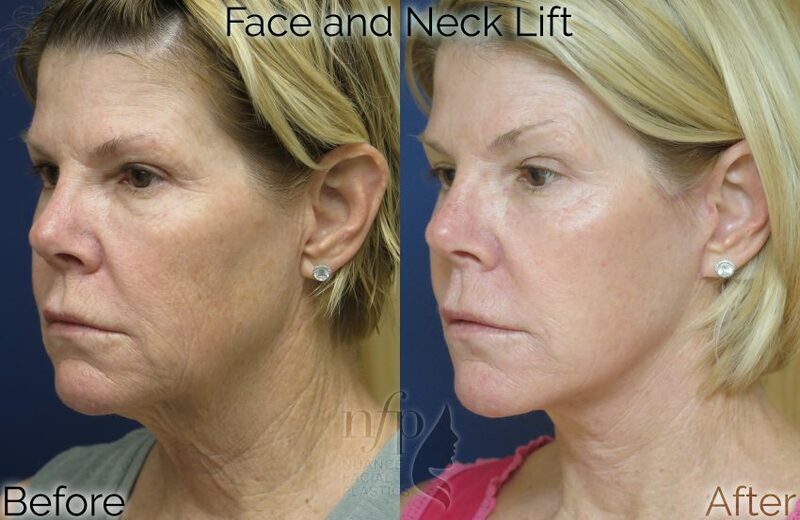 The mid face and cheeks can lose volume with time, and can require a lot of volume, or product, to augment. 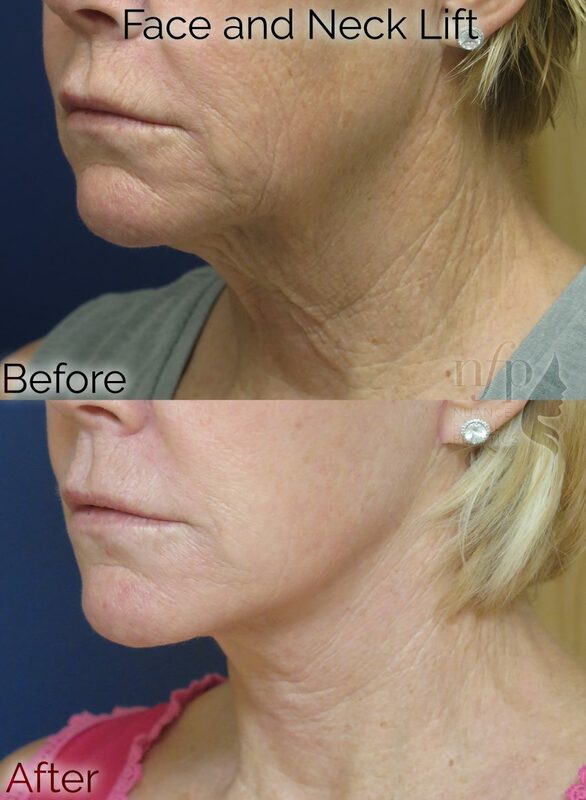 Sculptra does a good job, stimulating collagen production in difficult to treat areas. 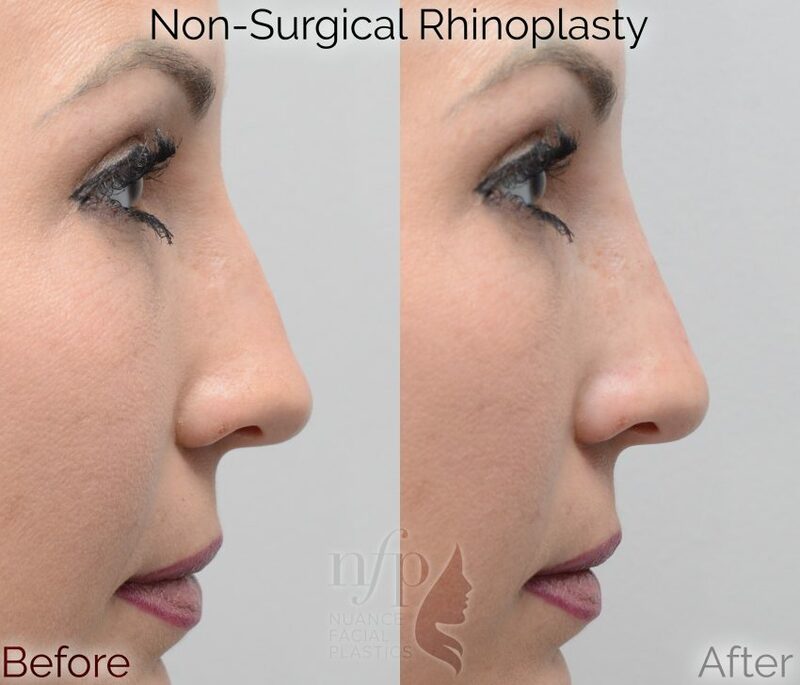 This patient had a subtle hump on her nasal profile, which we treated with a Non-Surgical Rhinoplasty. 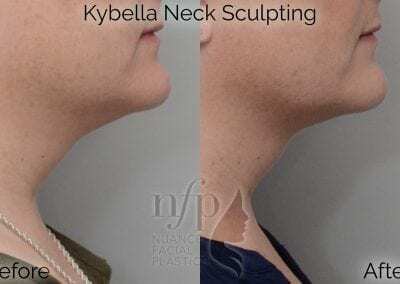 See her new straight profile! 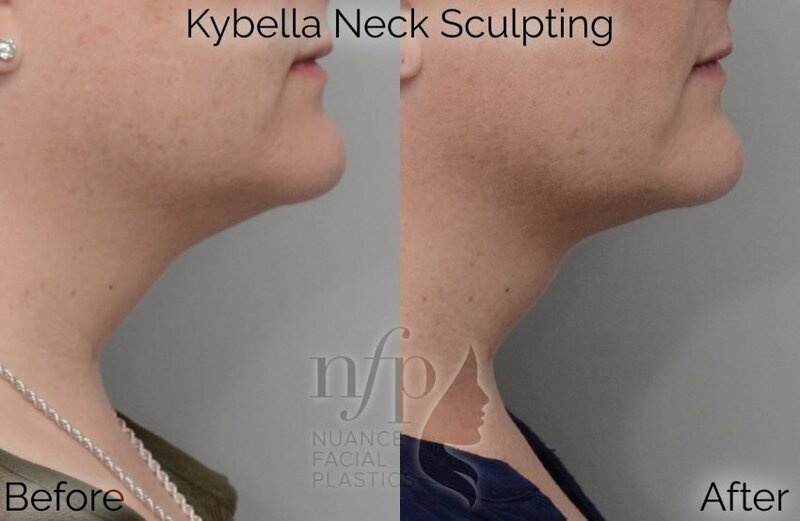 Before and After pictures from a patient that opted for non-surgical neck contouring with Kybella. 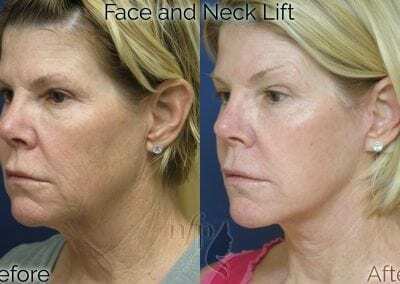 See her lasting results! 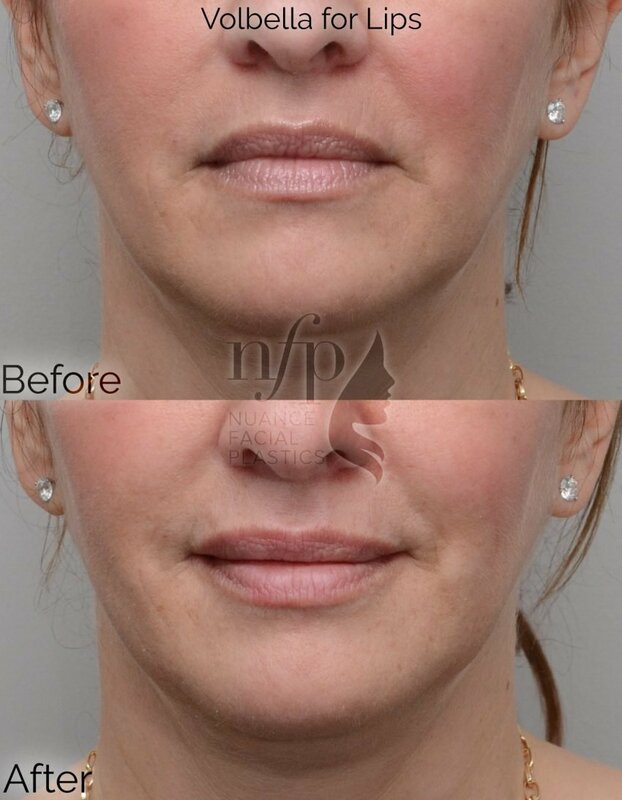 This patient did not like the “unhappy” appearance that the downturned corners of her mouth gave her. 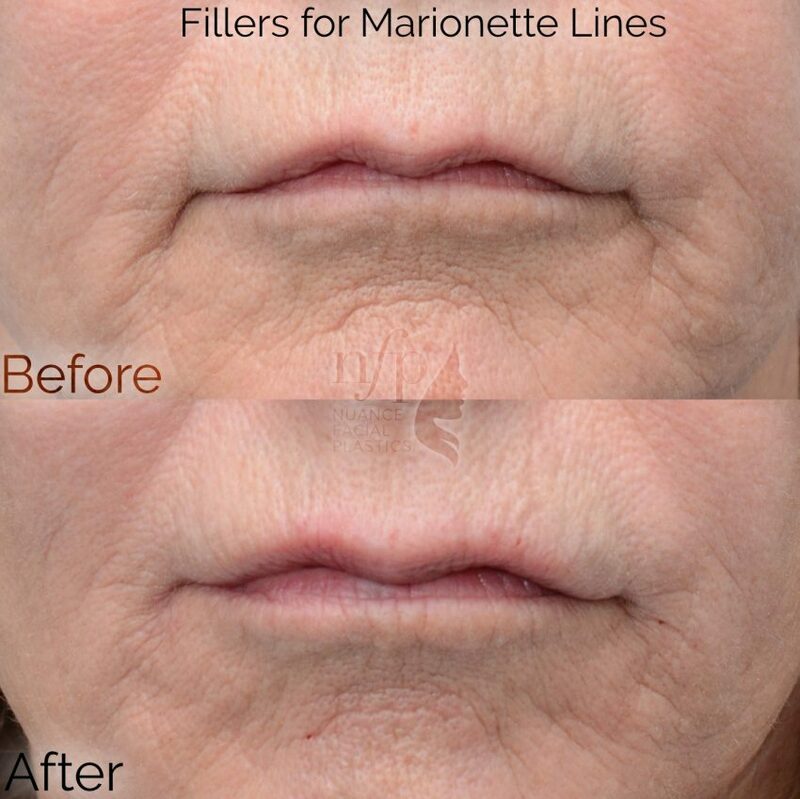 After a single treatment of filler to improve this, the corners of her mouth are much improved. 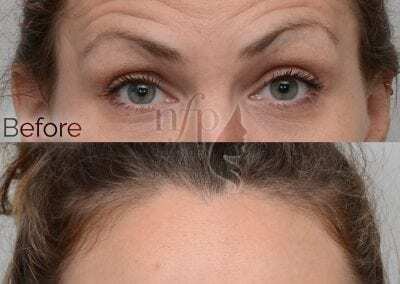 This patient wanted treatment of her forehead furrows and frown lines. 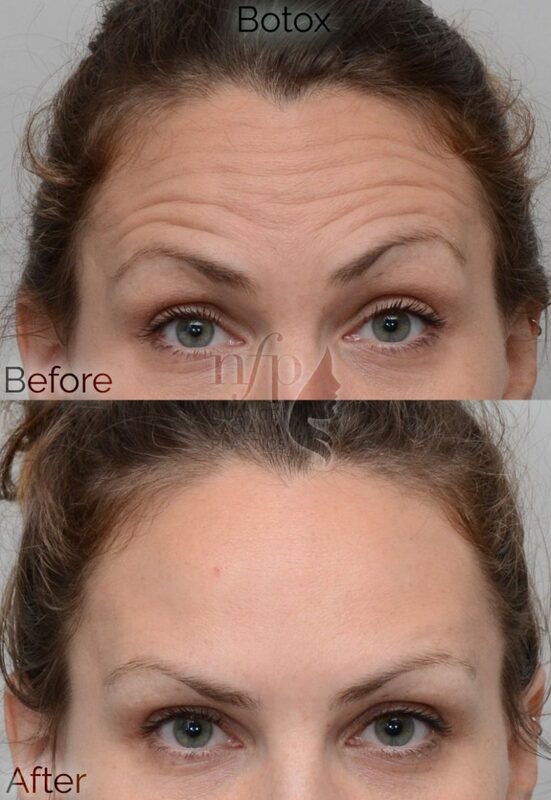 See the dramatic results from just 30 units of Botox in the Before and After pictures here.